Care2 Causes | Is Governor Larry Hogan a Real Trump Primary Contender? Is Governor Larry Hogan a Real Trump Primary Contender? With Republican President Donald Trump growing more divisive and volatile every day — and facing an ever-tightening Russia investigation — it’s no wonder that a number of GOP voters hope they can be saved by a primary contender to replace him on the ballot for 2020. So far, most hopes are pinned on Ohio Governor John Kasich, a self-proclaimed “moderate” who is teasing fans about a potential declaration — but he seems far more likely to hold out until 2024 instead. 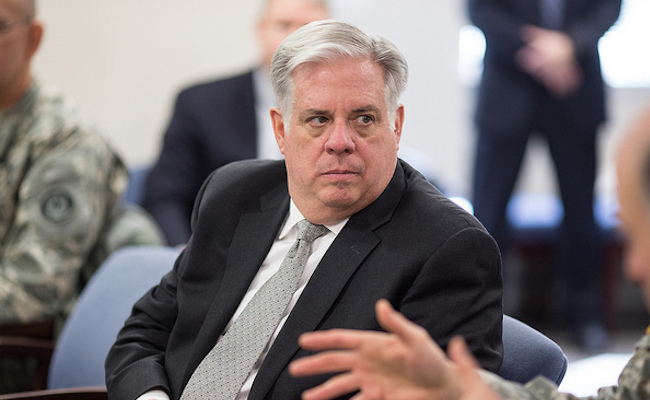 Now there’s buzz of a new possibility: Maryland Governor Larry Hogan. And unlike Kasich, rumor has it that his candidacy is worrying the Trump team. Republican Gov. Larry Hogan is acting a lot like a guy who wants to run against Donald Trump in 2020 — and the president’s reelection team is taking notice. The second-term Maryland governor has been implicitly going after Trump in speeches, meeting with Never Trump Republicans, and planning a March trip to Iowa as vice chair of the National Governors Association. Of course, Iowa tours are typical of anyone thinking about a future presidential run — whether that’s an immediate plan or a decade down the road. Hogan, on the other hand, has some pretty prominent supporters already. One of Hogan’s biggest challenges if he wants to mount a primary campaign is how relatively unknown he is outside of his own state. But that’s changing, as he gains support from longtime party icons like former Florida Governor Jeb Bush, who attended Hogan’s recent swearing in ceremony for his next term as Maryland’s governor. People on both sides of the aisle refuse to give up even a little to get a lot done. And neither side wants to make progress. They just want to make demands, and win arguments. That is not governing. That is just political theater. And most of us are just sick and tired of all that drama. Running in a primary is easy, though. Winning one against an incumbent? That’s a whole different story. An incumbent already has the name recognition, party apparatus and other advantages behind them. Challenging a GOP incumbent from the left is nearly impossible, since primaries tend to bring out the more extreme members of the party to participate. Then again, a primary may be less about replacing President Trump on the ballot and more about an easy way to raise Hogan’s profile to a national level – putting him in that much better of a position come 2024, when he could have a legitimate chance at taking the nomination and winning the White House. A primary challenge offers a test run for a future campaign, one that has almost no risk because no one expects him to win in the first place. It would also serve to highlight just how very extreme the president — and the remaining GOP politicians as a whole — have really become. That’s something that can only benefit Democrats in the long run. So, on behalf of all who are horrified by the path our country has taken, I can’t help but hope that Hogan chooses to run. I honestly don't care about an unknown. WE NEED THE STRONGEST CONTENDERS FOR 2020 PRESIDENTIAL RUN, IN BOTH PARTIES. CURRENTLY, WE HAVE A PRESIDENT WHO QUITE LIKELY IS A RUSSIAN ASSET, THAT TO BE PROVEN IN TIME AS INVESTIGATIONS CONTINUE. MEANWHILE, AMERICA SUFFERS THRU ITS LONGEST GOVT SHUTDOWN IN HISTORY! AMERICA IS IN DANGER AS NEVER BEFORE, FROM THE INSIDE OUT!!!! There quite a few people in the GOP who could easily fill Trump's shoes perferably with either vomit or animal feces. But then when the usual people say that there is a lack of leadership in the GOP is is a bit like a flock of owls saying an owl has a bit of a beak. If anything 2020 will bring out a badder and madder Trump and fur will be flying especially if that thing on his head gets free.